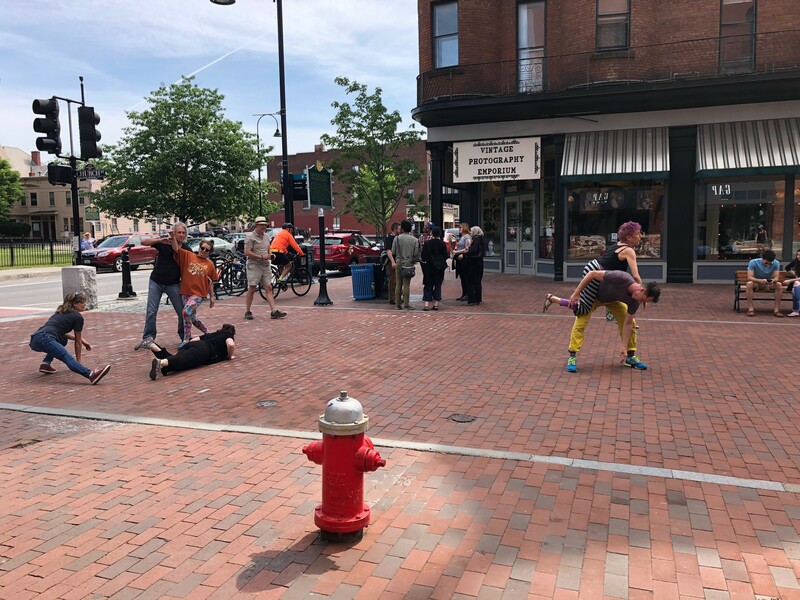 On Saturday, June 16, Burlington was struck by a confluence of dance-related events: "Traces," an all-day, multi-venue, outdoor performance hosted by the Vermont Dance Alliance, and "Lime Peach Mint: High Crimes Misdemeanors, Bountiful Performances" by Artists' Imperative at Maglianero. What follows is a diary of observations from the day. 9:45 a.m.: I walked from the top of Church Street Marketplace to the bottom looking for dancers. I didn't see anyone, because I forgot I was supposed to stay at the top. It was really nice out. 10:01 a.m.: I made it back to the top of Church Street. Six people were dancing in the street. 10:17 a.m.: I poked my head into the Gap after seeing employees peering out the windows. One said, "I thought they were warming up for AcroYoga." 10:23 a.m.: A little girl in a purple dress stopped in the street and stared at the dancers. "What are they doing?" she asked her mom, who was 15 feet away and looked impatient. "Contact improvisation!" whispered a gray-haired dancer clinging to the statue of late Burlington saxophonist Big Joe Burrell. 10:25 a.m.: Other people started to join in — two young kids, the children of some of the dancers, and a dancer's mother. 10:40 a.m.: A street performer started clapping and singing with the dancers, and they improvised to his tune. Everyone seemed jubilant. 10:45 a.m.: The performer said his name is John Holland, "like the old country." He asked me to stay and listen to a song that he promised I would love. The lyrics include the line: "Dance till you're dead, that's what the praying lobster said." 10:55 a.m.: By now we were all at the southernmost end of Church Street. Two blond women passing by Sweetwaters cringed and giggled. One said, "That's weird." 11 a.m.: The dancers weaved in and out of circular patterns, singing something along the lines of "Round and round we go, weaving ourselves in a circle / The day is done and the dance goes on." 11:30 a.m.: I stopped into Onyx Tonics Specialty Coffee for a cup of drip that I definitely didn't need. It was delicious. 11:55 a.m.: I found myself overly caffeinated and in the middle of the Burlington Farmers Market. A male passerby commented, "Everything smells like maple." 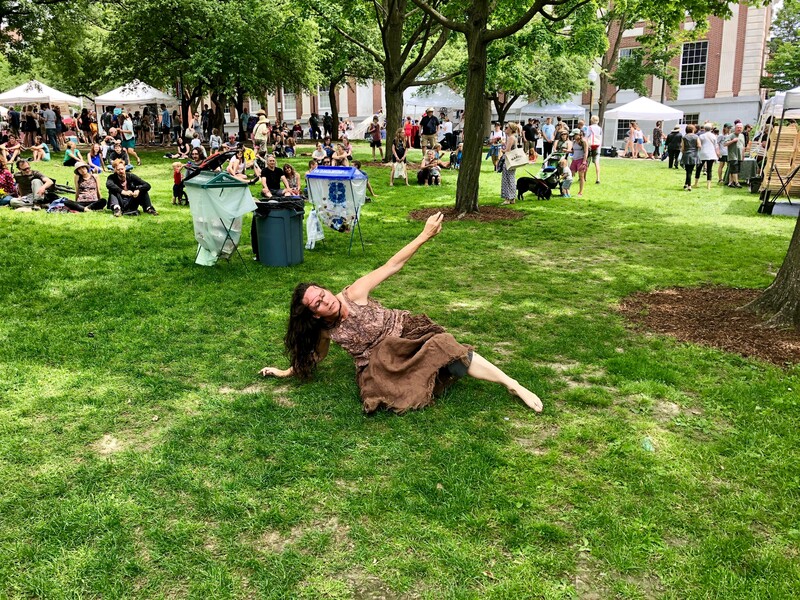 I wondered where the dancers would set up; the green space was crowded with families, friends and couples sprawled in the sun. 12:01 p.m.: I found a dancer, Annette Urbschat. She was dressed in brown rags, perhaps to imitate bark. She clung to a tree and screamed, "THEY AIN'T DEAD YET!" startling a few onlookers. A boy walking by smiled uncomfortably. 12:03 p.m.: Urbschat, clinging to the base of a tree trunk, stared into the eyes of an older man, who seemed to regret walking by so near her. She told him, "I feel empty inside." 12:12 p.m.: Urbschat began hugging a different tree. I felt hungry. Before leaving to feed myself, I squatted on the grass next to a family enjoying their lunch. "What do you think of the performance?" I inquired. "What performance?" the mom asked. "The dancer over there. 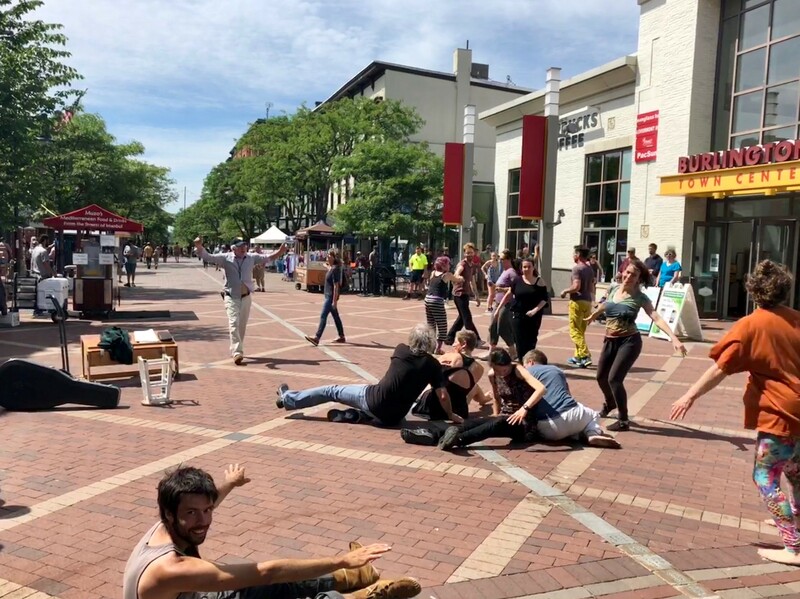 She's a part of a daylong dance performance around Burlington." The woman stared at me, confused. "Oh. We haven't seen any dancers," she said, brow furrowed. 1:48 p.m.: I caught the end of a performance titled "Cultured Elegance" on the Burlington Waterfront. Wearing floral tea dresses, the dancers were making ballet-esque moves. 2:04 p.m.: The next group of dancers, clad in neon spandex, were younger girls from Ballet Wolcott. They danced to "Montego Bay Spleen" by St. Germain. The people walking by on the bike path seemed to enjoy the performance. 2:13 p.m.: Two of the older dancers (perhaps in high school) moved robotically to a creepy song that sounded like it was from a horror movie about dolls. One of them seemed to have a hard time keeping a straight face. I left shortly after the piece concluded. A sunburn was emerging on my shoulders. 7:25 p.m.: I returned in the evening to Maglianero for my final dance-related event of the day. Artists' Imperative, organized by Marc Wennberg, Clare Byrne and Alec Julien, brings together artists of varying disciplines to respond to a single theme. In this case the performance was called "Lime Peach Mint." In case anyone didn't grasp its meaning, the back of the program listed the second article of the impeachment clause from the U.S. Constitution. 7:45 p.m.: Vermont filmmaker Nora Jacobson and her partner David Ferm took the stage and performed protest songs on banjo/accordion and guitar, respectively. After their set, Jacobson told me she was nervous. 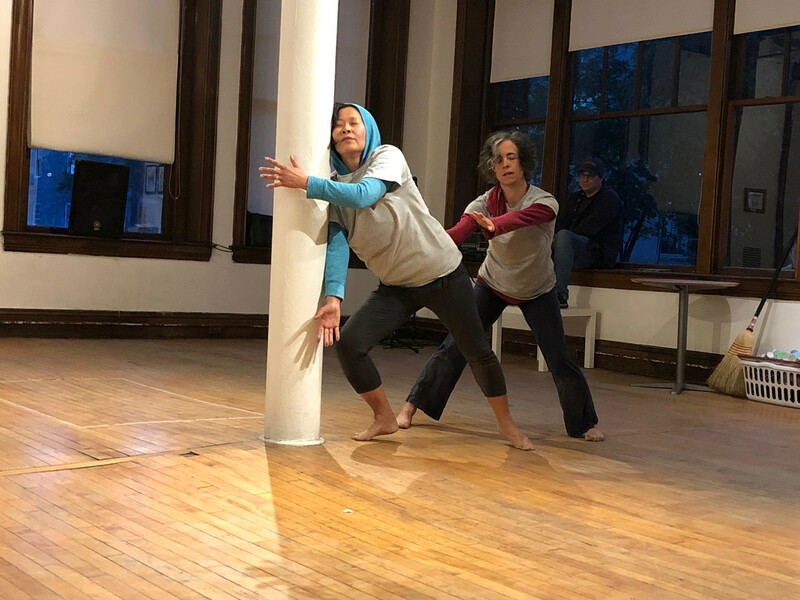 Annette Urbschat and Ivo Tobin Lippold performing "How to Stop a Bully"
8:03 p.m.: Urbschat reappeared with her son, Ivo Tobin Lippold, to perform a piece about bullies (pointedly, President Donald Trump). 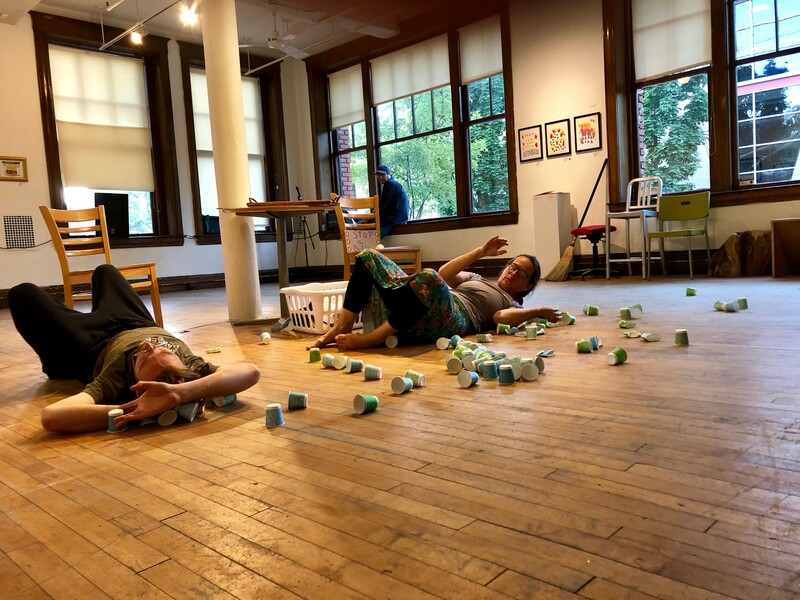 She began by folding laundry as Lippold passed out tiny paper cups of kombucha. The two transitioned into movements during which they intermittently screamed, "STOP THE BULLY." Lippold read aloud from a book about bullies, while Urbschat made a stack of paper cups. Both then knocked over the cups and rolled around in them on the wood floor. 8:15 p.m.: Dr. Tango, aka Elizabeth M. Seyler (disclosure: Seven Days assistant editor), presented an autobiographical piece about gender roles in dance. Seyler noted that many men are offended by a woman who wants to lead, or who will dance with other women. 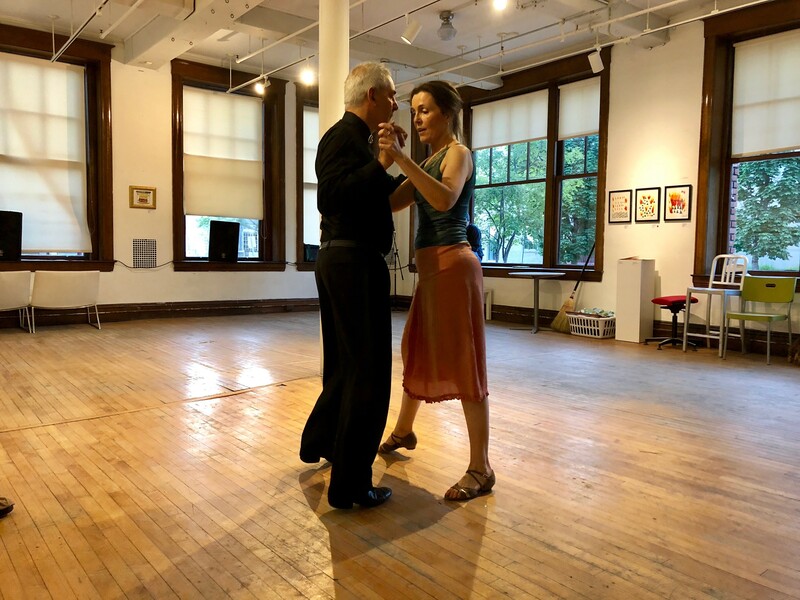 She said that a Vermont man once told her, after a tango party, that she was welcome back at his residence only if she "followed," and if she danced exclusively with men. Elizabeth Seyler and a guest dance in her piece "Swing, Tango, Tribe: Evolution of a Feminist"
8:30 p.m.: Two members of the chamber music ensemble Heliand Consort expressed the view that continuing to play their music constituted a protest against an administration that doesn't support the arts. I didn't see how continuing to do what they do was an act of protest, but their music was beautiful. 8:55 p.m.: Clare Byrne and Chong Ho Kim danced to accordion music by local composer/musician Randal Pierce. The improvisational, collaborative piece was called "slowly my dear, moving to the next stage (with eyes closed)." In it, the dancers ran away from each other and rolled around on the floor. 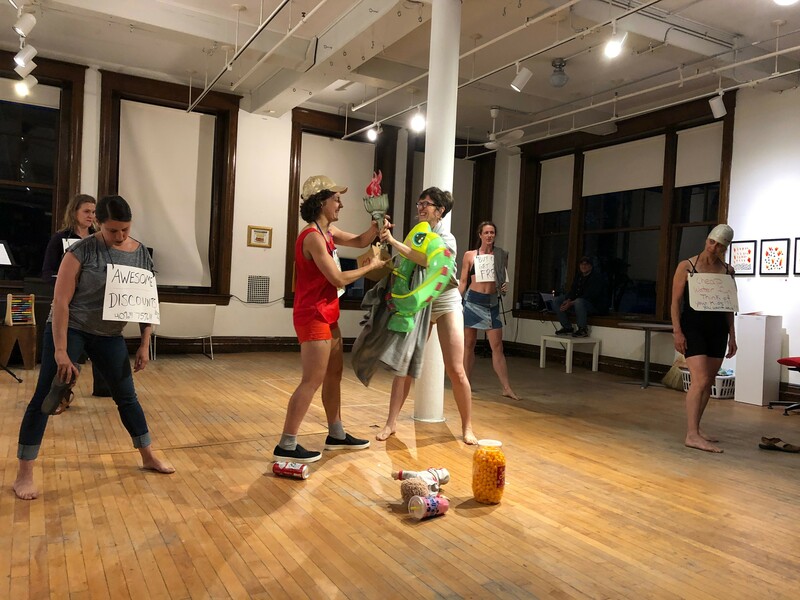 9:10 p.m.: In another piece, choreographer Avi Waring (cofounder of Ballet Wolcott) presented a crew of "zombie salesmen" that enticed the Statue of Liberty with pool floaties, slushies, fast food and other icons of American consumer culture. Liberty vigorously disrobed, exchanging her garments and accessories for these objects. The piece ended with the American symbol of welcome in a heap on the floor, clutching her new treasures. Cheese puffs rolled on the floor around her, as the zombie salesmen crowded her and pulled at her spoils. This piece felt utterly depressing and sadly accurate.